I am sticking with the theme of quick and easy recipes as this good weather continues. The other night I hosted some friends and we were all really in the mood to be outside. When this happens, I almost always resort to the BBQ. The menu called for simple beef hamburgers atop a lightly seasoned Portabello mushroom. Tomatoes and avocado were the perfect toppers, along with a spiced mustard. I will especially enjoy making this meal again later in the season when the vegetables from my garden are ready. I completed the meal with a side of mashed sweet potatoes, which just so happens to be a recipe I posted not too long ago. Whenever I am making hamburgers, I make sure that the ground beef is not too lean. Reason being, I do not like to season the meat too much, so the more fat on the meat, the more flavor. That being said, by no means do you have to limit your seasoning. Pretty much anything goes! I will share with you what I did; however, feel free to add your own twist. In the recipe, I didn’t specify any specific topping to use with those burgers, but the reason is to let you choose what you prefer and what you have available. Almost anything goes. A good homemade condiment like ketchup or mustard is a great choice, so is a homemade mayonnaise. As for the vegetables, tomatoes, lettuce and avocados are great. I also personally really like a sliced, crunchy and naturally fermented dill pickle. Place the ground beef in a large bowl and add the eggs. Combine until the eggs are evenly mixed through. Mix in the garlic and season with salt and pepper. 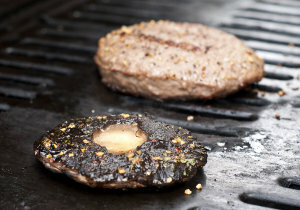 Form 6 to 8 patties that are slightly smaller than the mushroom caps so they can fit on top once cooked. Place on a preheated grill and cook each side for about 5-7 minutes (the time it takes will depend on the temperature of your grill. I cooked them at medium-low for approximately this time). Rinse the mushrooms and pat them dry. Remove the mushroom stems. The reason for this is because you want your mushroom cap to take the form of the hamburger bun. Do not discard, they can be great for many other recipes, or you can grill them along with the caps. Coat the caps in olive oil and then season with salt and pepper. Do not let the oil penetrate for long, as you will notice the mushrooms will start to get soggy. Place on the preheated grill and cook on each side for about 5-7 minutes. Now all there is left to do is stack your patty on top of your mushroom and add any toppings you desire. There you have it! 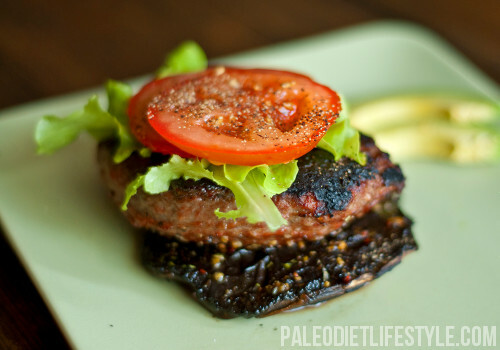 The complete Paleo hamburger. Enjoy!